Luxfer, the world's largest manufacturer of aluminum high pressure cylinders, offers a broad range of high-quality, high-performance CO2 and beverage cylinders. 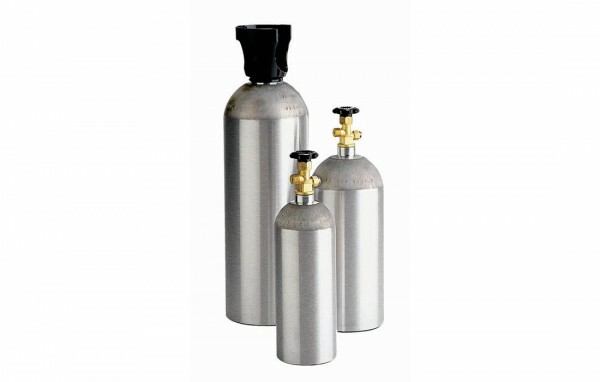 Luxfer was the first company to manufacture cold-extruded aluminum CO2 cylinders for beverage service. Clean, corrosion-resistant, lightweight Luxfer cylinders remain the ideal choice for commercial dispensing beers, lagers, ciders, stouts and carbonated soft drinks, as well as for use in "kegerators" and other home-dispensing devices. CO2 is used as a shield gas in MIG/MAG welding, protecting the weld-puddle from oxidation from surrounding air. Cold sterilization of medical instruments using a mixture of 90% carbon dioxide and 10% ethylene oxide. CO2 added to oxygen as a respiration stimulant. Carboxytherapy, a cosmetic treatment for skin conditions such as stretch marks, dark circles under eyes and post-liposuction lumps. Luxfer cylinders are also used to contain nitrous oxide used in dental applications. Enriching air in greenhouses to increase plant growth. CO2 as a propellant in paintball markers. Luxfer offers an exclusive, higher-pressure (4,350-psig) hoop-wrapped cylinder (S106W) that may be used for transfilling paintball cylinders used in markers. The beverage industry has seen a significant shift to the use of aluminum, instead of steel, CO2 cylinders. What are the reasons for this move to aluminum? As shown in the photos below, when looking at a cross-section of a used steel CO2 cylinder and a comparable Luxfer aluminum CO2 cylinder, the difference in internal service condition is clearly seen. The steel cylinder shows significant evidence of rust and corrosion, whereas the Luxfer aluminum cylinder shows none. In fact, aluminum cylinders seldom show signs of corrosion, even after many years of service. Why? Aluminum provides an inherently stable storage environment due to its hard surface oxide coating. The cylinder exterior is exposed to wear and tear, but the oxide coating naturally renews when damaged. This process is very different from steel, on which rust forms (due to the carbonic acid created when traces of water mix with CO2) and flakes off, constantly exposing new metal to corrosion. Several industry studies show that a clean, corrosion-resistant interior helps maintain the quality of cylinder contents. Bottom line, rust can potentially contaminate CO2. Aluminum cylinders can weigh up to 30% less than comparable-sized steel cylinders making them easier to move and transport. This weight difference results in potential savings in fuel, shipping and transportation costs thereby adding to the cost-effectiveness of an aluminum cylinder. Furthermore, corrosion can result in steel cylinder failures, which requires replacement and adds to overall costs. 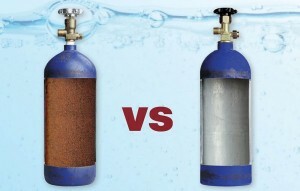 When considering a CO2 beverage cylinder, not all cylinders are created equal. Compared to steel, aluminum CO2 cylinders are far more rust- and corrosion-resistant, lighter in weight and highly economical especially when looking at a cylinder’s total cost of ownership. Below is a link to our latest CO2 and Beverage cylinder brochure. For the latest version of our CO2 and Beverage Care and Safety Poster please click here. Please contact your Luxfer Customer Service Representative at 1-800-764-0366 or 1-951-684-5110 for the latest CO2 and Beverage promotions. Luxfer is the world's largest manufacturer of aluminum high pressure cylinders including a broad range of high-quality, high-performance CO2 and beverage cylinders. When considering a CO2 beverage cylinder, not all are created equal. Compared to steel, aluminum CO2 cylinders are far more corrosion-resistant, lighter in weight and highly economical especially when looking at a cylinder’s total cost of ownership.